Christmas is the season for giving—to let others know that you care. It’s the season where generosity and love spread farther than any other time of the year. The purpose of the holiday is love. The purpose behind each gift we buy is to show an appreciation for the person; to let them know that we care and that they are in our heart. It’s about love. The Love that God showed when He sent His Son to be born to us, and eventually die for us. It’s about the love that encompasses us all when we’re thinking about those that we shop and cook for, and the time we spend visiting others. 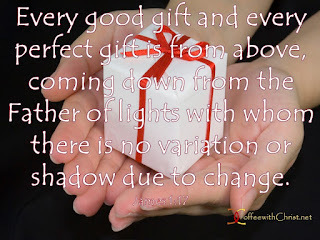 No matter religious (or nonreligious) beliefs, it seems that almost everyone gives of themselves during this holiday, and typically, in ways that they don’t throughout the other eleven months. And that is what it’s about. What better way to show our Christ to people than to give; time, gifts, love? But let us not forget that He is the reason we do any of this. What if our problem throughout the year is that we don’t really believe that Jesus Is everything He Is? We doubt, we make excuses, we wander… God’s promises never fail (Hebrews 6:18). God never fails us; we fail Him. We easily celebrate Him at Christmastime, but what if we celebrated Him all year through? It’s not God that disappears when Christmas is over, it’s us—our faith, our trust, our love, our belief. Belief that He still remains. Belief that He still promises. Belief that He still loves.